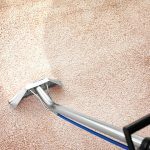 Hot water extraction is the process of injecting hot water and cleaning solution in to the pile of the carpet to dislodge any debris, whilst extracting any dirt and stains from the carpet using powerful wet vacuums. Most reputable carpet cleaning companies will use the hot water extraction method of carpet cleaning, simply because it’s much easier and provides optimal cleaning results over the other cleaning methods that are available. A hot water extraction carpet cleaning machine usually has two chambers. A solution tank to hold the clean water and cleaning solution and a recovery tank which is where all the dirty water is extracted to. A high pressure water pump shoots hot cleaning solution from the solution tank in to the carpet, which helps to place any ingrained dirt and debris into “suspension.” Then powerful twin vacuums extract this dirty water and debris into the recovery tank on the machine. This entire process is completed in a matter of seconds due to the high pressure of the pump and the power behind the vacuums making it a highly effective and speedy method of cleaning carpets. What are the Benefits of Hot Water Extraction Carpet Cleaning? Having your carpets cleaned with a hot water extraction carpet cleaning machine is eco-friendly and much kinder to the environment than other cleaning methods such as bonnet cleaning or carpet shampooing. HWE machines only need a very small amount of water and detergent which means this specific type carpet cleaning does not waste water and use large amounts of soap to achieve excellent cleaning results. All detergents and solutions that are used when cleaning with a hot water extraction machine are 100% biodegradable meaning that any waste water that is disposed doesn’t harm the environment in any way possible. Hot water extraction carpet cleaning is by far the most effective method of carpet cleaning today. The speed an ability to remove stains quickly and efficiently is second-to-none and 99% of the time all stains can be removed from carpets including make up, tea, wine, coffee, blood, carbonated drinks, food and oil. In the unlikely event that a hot water extraction machine can’t remove a particular stain, a professional carpet cleaning company will always come equipped with a secondary option and have a vast collection of stain removal solutions that can tackle any stubborn stains that can’t be shifted. Because of the small amount of water that is required and the amount of power behind the vacuums that extract the dirty water from your carpet; hot water extraction carpet cleaning can have your carpets dry within 2 to 4 hours after cleaning. Dated cleaning methods can leave lots of soapy residue in the carpet and are at risk of over-wetting. This can cause mould and mildew growth that can lead to a number of respiratory and lung related illnesses. By having your carpets professional hot water extraction cleaned you completely eliminate any health risks and chances of this happening. A professional carpet cleaning company who has been trained in hot water extraction cleaning is always the best choice when you’re thinking of having your carpets cleaned. Avoid carpet cleaning companies who offer other methods of carpet cleaning as ultimately the result won’t be as affective and could cause you a number of issues with your carpets going forward. About the Author: Ben Cottie enjoys helping others with carpet cleaning tips and advice for more efficient cleaning. Ben, heads the carpet cleaning division at AAAClean. A carpet cleaning company who provide domestic and commercial carpet cleaning services to customers in Kent and East Sussex.